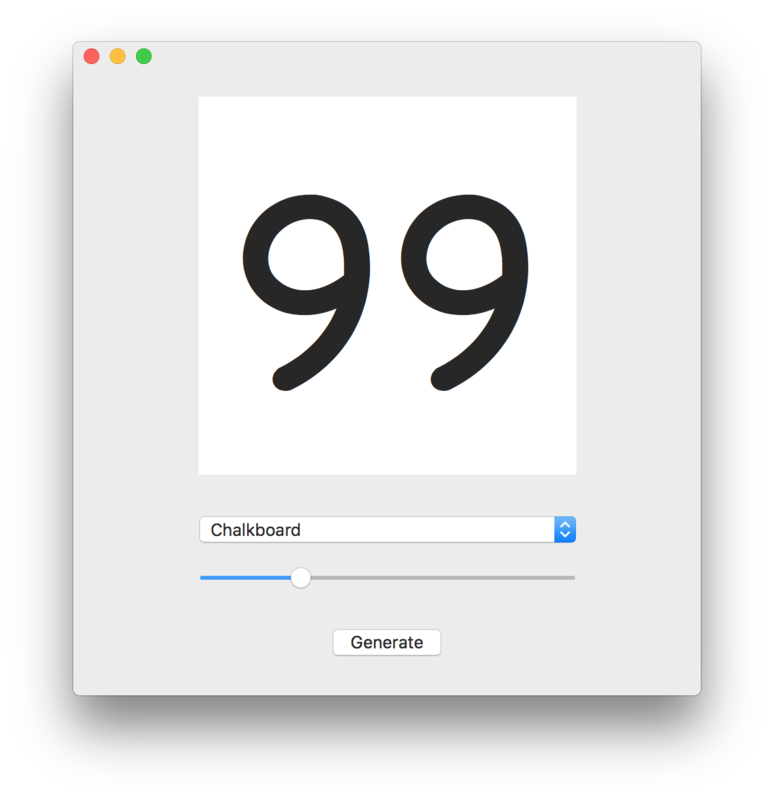 I'm looking for a pack of images, each one of a number from 0 to 99. PNG format would be best, but if that's not available I'm not fussy. If there was also a way that I can script this in Photoshop or in Automator (Mac), or some other way to create them. I'd like to download something to test an idea, but eventually will have to make the images to my own specs. This seems like the kind of work that many people on the internet have done, and hopefully uploaded for others to use. (I tried a Google search, but didn't turn up anything). When I needed this, I just wrote out a suitable TeX file and converted the output pdf to a bunch of pngs using the usual command line pdf manipulation stuff. You could do the same with whatever word processor you have to hand that will output pdf. OSX used to ship with a tool called sips, you could use that to convert the pdf to a bunch of pngs if it’s still there, or just install imagemagick from MacPorts and use the convert command. Maybe ImageMagick's text drawing functions page would be useful, if combined with a loop in the command line. Mac install instructions. --font='TwentyfourSixteen Regular 48' --hinting=full --output="$f.png" -t "$f"
Here's the result: numbers.zip. You may not dig obsolete HP alphanumeric LED displays as much as I do, though. I had a spare half hour at lunch so I knocked you up a little Mac app. You can choose the font and size, it will then generate the PNG files into a folder on your desktop when you press the button. They will be the same size as the preview, so you can resize the window to make them bigger/smaller. I've also included the Xcode project if you want to have a play/make sure it's not a virus. And, like scruss, here's the result: numbers.zip. Leave out the "-w" if you don't want leading zeroes. Thanks everyone for going above and beyond! I'm going to use derbs' Xcode project, because that's what I know, and I can adjust the parameters myself. I should use ImageMagick but I always get nervous about installing things in the Terminal with sudo (I have a separate machine with Ruby installed because of this).